Adding API access to the camera would be a very good idea. 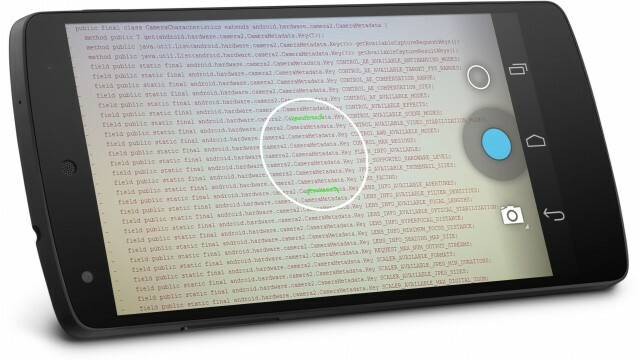 A natural way for google to break out of androids camera doldrums. Potential applications could be very exciting. The Nexus 5 camera was a huge disappointment, especially after comments from high-ranking Googler Vic Gundotra stating that "we are committed to making Nexus phones insanely great cameras. Just you wait and see." This commit was pushed on October 11, about a month before the release of KitKat. A month before release was probably "feature freeze" time, where work on new features stops and everyone focuses on fixing bugs in time for release. The camera revamp didn't make it and was replaced with the original camera API.